Mesa Arizona Pool Builders | The Best Custom Swimming Pool Builders in Arizona! Build your Personal Oasis with New Image’s Custom Pools! In Arizona, a pool is almost a necessity; however, that doesn’t mean it has to be a bland addition to your home. 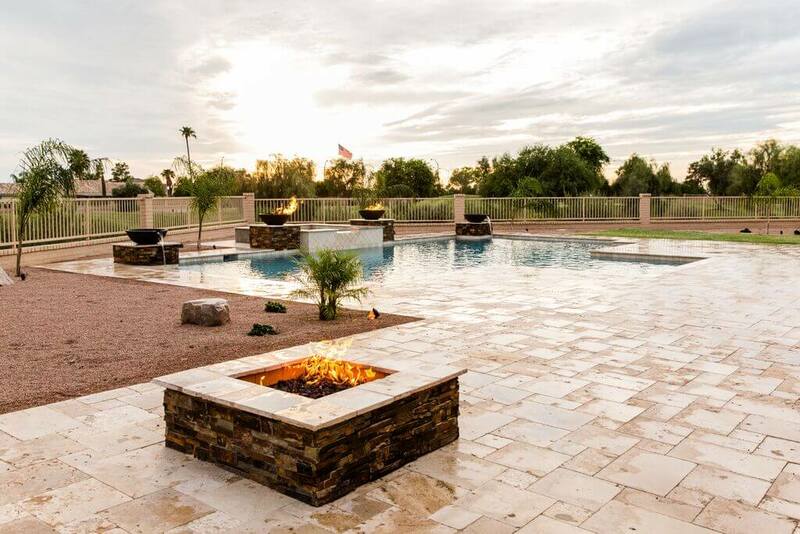 In fact, with New Image’s custom Mesa Arizona pool builders services, we can help turn your pool into a beautiful fixture that not only compliments the exterior of your home, but improves your property value AND gives you something that you can be proud of. Trust us; if you’re looking for the pool of your dreams, you are in the right place! From custom built spas, to beautiful waterfall fixtures and more, New Image Landscape and Pools offers a variety of products and designs to make your pool into something that everyone can enjoy. Whether you are looking for a whimsical jungle, with rock fixtures, waterfalls, and bubblers, or a new age look that’s sleek and futuristic, we can help make your dream a reality! Of course, if you’re not sure what you want, coming up with the design that fits your pleasure can be difficult—especially if you haven nothing but pen and paper to express your desires. That’s why, here at New Image, we have come up with a way to make sure you get the pool that you want, without misleading projections! Our 3D design software allows us to craft your pool digitally so you can tweak fixtures, change textures, and even scope out the viewpoints from your home so you know precisely what you are getting before we’ve broken ground. Even better, because we can drop you right into the middle of a 3D world, our dynamic software allows you to “walk” around your pool, giving you an up close and personal view of fixtures that haven’t even been installed yet! It’s truly a powerful software that can help you come up with the design that you want, while greatly decreasing the chance of any future missteps. Family Owned with Experience that you can trust. We here at New Image Landscape and Pools love our jobs so much that we have been working for over 35 years, providing beautiful homes and pools to those looking to get a little extra out of their exterior landscape. In addition, we only hire amazing staff with expertise in the field and the same love of pools and landscapes that we ourselves employ every day. This, along with our licensure, has allowed us to gain the skills we need to grant you the results that you desire! In other words, you can trust the products and designs that we build for you. Contact us today for more information and to see why so many choose New Image Landscape and Pools for their custom designed pools. Don’t forget to ask about our custom landscapes and designs!